There's certainly some interesting stuff coming out. I wish they would have carried on reissuing the Gaunts books as a three book hardback set as they did with the first three books. I'm guessing they didn't sell very well as the first set of three hung around for ages? Fabius's original lab on Harmony had clones for ALL 20 primarchs, very interesting that Fabius could get genetic material for the missing Primarchs, big shame that was all was mentioned on them. I liked warmaster but the first few ref's to things that, apparently, occur in some of the Sabbat Crusade short stories threw me a bit. "A giant of a man clad in baroque power armour, his face contorted in a permanent scream". One assume Trazyn would dress his collection appropriately, wonder if this is him/it ? Trazyn mentions that a couple of hundred years before meeting Fabius he nearly managed to add another Primarch to his collection, so Fulgrim might have been the one you mention, or number 2 in the collection? I thought it was either Vulkan or Dorn that Trazyn had? Trazyn needs his own book covering this stuff as there are loads of lore nuggets, he has a whole mid battle scene made up of frozen UM and WB during the underground war on Calith, a Krork (the orginial orks) that has power armour better than Fabius's heavily improved SM power armour, and a ton of other stuff. i finished First Lord of the Imperium. what a magnificent trollfest. i'm still not sure how i feel about it. Well huge change to 40k world. Surprised there's not been more fuss about it. as someone whose not a big fan of audio dramas. can you spoil? -Emperor was not Emperor until he met Malcador that was born some 6000 years or so ago(he remembers his own birth by the second). -Heresy was basically deliberate action by Emperor. He never intended marines to stay long so much like thunder warriors they were meant to go. They were meant to exterminate each other once they had served their function of taking humans(not post-humans) to the stars so basically Emperor was making damn sure there WOULD be civil war. Chaos accelerated things though a bit. Some other stuff but those were the big ones. 6000 years ago would conflict with Master of Mankind... so SOMEONE is lying. the heresy being deliberate makes sense too. Sounds to me like GW is deliebratly trying to add some confusion and mystery to the story of the emperor. a good decision. It's better when we don't know. Memory fails me. Did they refer to Malcador's age in Master of Mankind? 6000 years ago was here birth of Malcador, not when to-be-Emperor and Malcador met. No but if the emperor wasn't the emperor before then... what was he? an ordinary man? Just the best of the Warlords according to Malcador, I suspect this is a lie. We know from PoV scenes of the Emperor that he was much much more than this. I suspect the biggest thing that didn't go to plan was Magnus destroying the wards around the Palace and scuppering the web way as the web way should have followed the Great Crusade/Heresy. 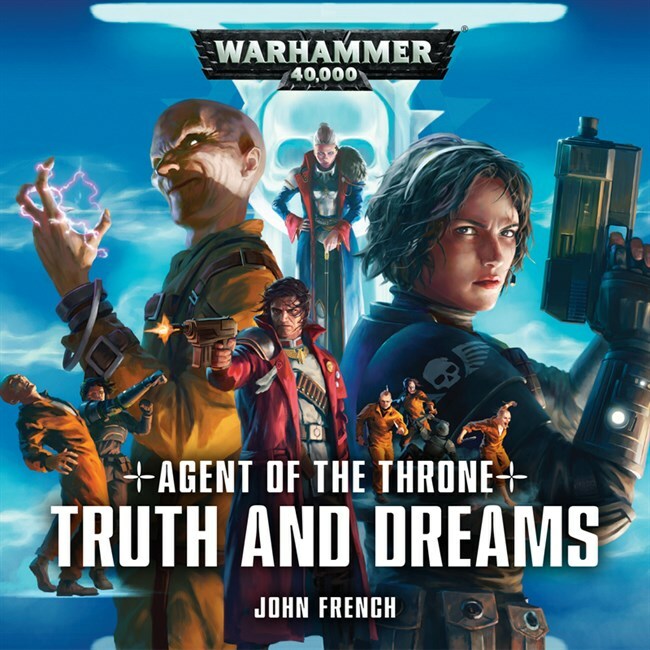 There is some discussion on this audio book in the previous thread thats worth reading if you want spoilers. Honestly I know they kind of have to brush on the emperor given the topic, but with some of the recent work they've put out I almost wish they would just go back to leaving it for fans to just mull over with little information one way or another. While I was initially quite excited by the Horus Heresy, a lot of these 'big reveals' are...less than satisfactory. Some might make a bit of sense, maybe, but it almost does feel like a bit of a troll job at times. I am sure that no matter what ideas they went with it would be impossible to please everybody as so much has been ill defined and fans allowed to fill in the gaps (as with all great universes), best case is that they please as many people as possible. I'd be interested in a detailed survey on people's opinions on the reveals once the series is wrapped up to see if they managed that. My personal peeve with the series is that you get internal monologues for the Primarchs, which might seem weird as I mostly love the Primarch series, but I think that the Primarchs thought processes should be so alien that they'd make no sense to even a trans human. Instead we often end up with the monologue of a petulant teenager. Well, that kinda matches their actions - most of what the Primarchs do over the course of the Crusade and Heresy doesn't make a whole lot of sense unless you place it in the context of a bunch of squabbling, petty, status-obsessed siblings vying for the affections of a distant father figure and becoming stroppy & rebellious when they don't get them. Please God just let them reach Terra. Scary to think HR was written in 2006. Im all for fleshing out a fairly epic story but BL have been milking this for years now. Might be something or nothing, I had my MMPB pre order of Corax cancelled by Amazon yesterday. The only other time I recall this happening was when Dan Abnett got ill and Prospero Burns got delayed, but as I believe Corax has already been published, that can't apply here. They didn't have to be like that though, BL had the choice to remove that element from the story and make them more sensible. Any time a demi god who is meant to be operating on level beyond human ability makes a decision even I, king of bad decisions, thinks is stupid, then something has gone wrong. It does however match the behaviour of most divine or semi divine entities in Mythology - the only thing missing is the love affairs with each other and mortals. I do think it can go too far in some depictions but most of them seem to be severely damaged - especially emotionally. But those are creatures of their emotions, mostly lust I've always held the belief that the Emperor made the Primarchs to be above simple pleasure seeking, I can't remember if we ever had conclusive proof if they were capable of a physical relationship or like Ken dolls (before the Heresy, afterwards I dread to think what Fulgrim got up to once he turned). Obviously Angron is a creature of rage, but that was his Chaos souped up butcher's nails exacerbating the issue. Whatever the Emperor intended them to be, he used the power of the Four in their creation and there's no way that didn't warp them to some degree, even the ones that stayed loyal in the end. And they could have changed things, sure, but given the things they have chosen to change and how they chose to change them, I'd prefer they keep that sort of thing to a minimum - the Heresy was always a Greek tragedy writ large. We only need the Emperor to become golden rain to laid down with Malcador and give birth to Horus. Then we can call the Horus Heresy a proper Greek Mythology background. I hope this one is a bit more open to people outside of GW HQ than some in the past. Haha, fingers crossed for Shinros winning, a death themed story is right up his alley. I might submit something too, my years of fanboying over Dark Souls, Medievil, Ghosts and Goblins, Maximo might finally pay off. Can’t wait to read CSI: Terra! Yup I am going for it, hope I get it. I already picked out an extract now to make all my mates read and criticise it!